LATICRETE International is a family-owned, global manufacturer of construction supplies. Choose LATICRETE® L&M™ concrete surface patch and repair products to repair slope or level structurally sound, concrete surfaces that are pitted, worn, scaled or spalled. Our comprehensive line allows you to repair deep voids, resurface existing concrete surfaces, stop water flow and seepage through concrete and masonry openings, provide a self leveling underlayment and prevent damage from mechanical impact and abrasion and chemical destruction in both interior and exterior applications. LATICRETE concrete repair products can be used in concrete flooring to vertical and overhead patch repairs. Select from products offering extending working time to rapid setting concrete repair and concrete patch products designed for quick pedestrian or vehicle traffic. L&M™ DURACRETE™ is a single component, polymer- reinforced, high-strength, cement-based patching and resurfacing mortar. L&M™ CRYSTEX™ is a long work time, ready-mixed, high strength, highly fluid, controlled expansion grout with superior dynamic load stability. L&M™ DURAGROUT™ is a ready-mixed, non-shrink, nonmetallic, flow-able, high-strength structural grout. 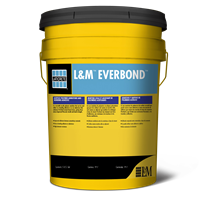 L&M™ EVERBOND™ is a versatile acrylic polymer emulsion that can be used either as a bonding adhesive or as an admixture. L&M™ DEBOND® is a non-staining, VOC-compliant, 100% chemically active, concrete form release for application to all types of concrete forms.